I’ve been a Munchkin Fan for as long as I can remember. 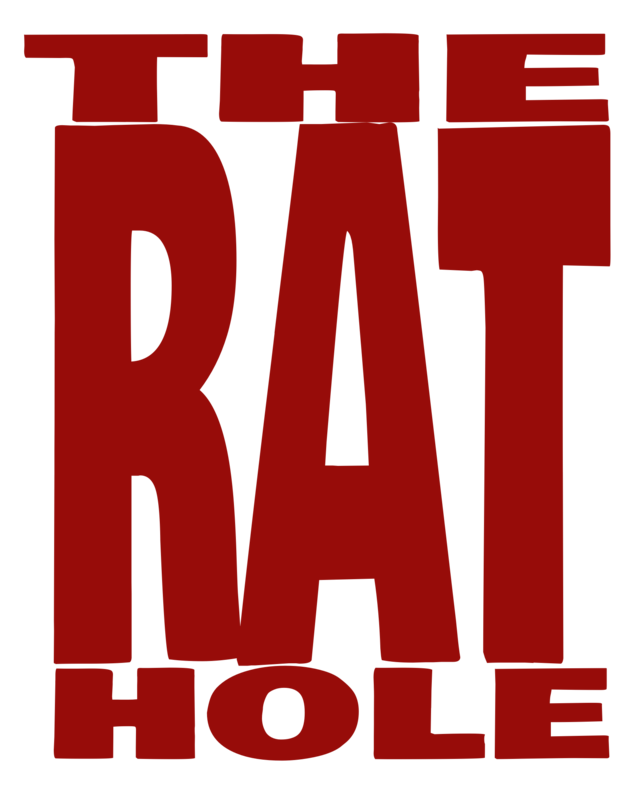 I loved the concept, I loved the gameplay, and most of all I loved the snarky attitude of it. I actually DO remember when I became a fan of the Turtles, it was issue #1 of the original Archie series. That being said, life has forced me to come and go from the TMNT fandom over the years. Similarly, it’s been far too long since I’ve picked up a Munchkin game. (There wasn’t even a new Christmas offering for me this year.) So there may be elements in Munchkin TMNT that are new to me, but that are not exclusive to this version of the game. Let’s start with what is the biggest change for me. In the original Munchkin, you started as a Level 0 Human with no Class. As the game progressed you might end up changing your Class, Race, or even Gender. In this version (and I’m told in a few others) you start as a specific character (with a specific race, to make integration with other Munchkin titles more amusing). Everyone gets a character card, with a conveniently built-in level tracker, and an individual bonus ability. Having that bonus ability gives a little extra oomph to the theme, and some extra variety to a title that’s been a game night staple for years. Since there are people out there who have never playing Munchkin, let’s quickly look at how the game works. Some of the details will differ by theme, but these are the basics. As I mentioned, every player starts at Level 0. The goal is for your character to reach Level 10. Most of that advancement will come by killing monsters, although Levels 1-9 can also be gained from playing cards or selling items, Level 10 can only be achieved by killing a monster. In the original game, a player can gain or change their race (ie: Elf, Dwarf) and Class (ie: Theif, Fighter). In this version, the bonuses that those changes gave have been replaced by Stances and Katas. Both things give bonuses, but Katas can actually be stacked depending on your base level. There are also Ally cards that can give bonuses and can be discarded from play to activate Teamup (bonus) Abilities. All of these bonuses add up to your combat level that a player will compare against a Monster’s level. When a player’s turn starts, they Kick Down The Door by revealing the top card of the Door deck. If that card is a Monster, they fight it. If it’s a Trap, it goes off. If it’s something else, they keep it. If the player didn’t have to fight a Monster, then they get to either Look For Trouble (fight a monster from their hand) or Loot The Room (draw another Door card). If they fight a monster and win, that player gains a level and gets a card from the Treasure deck. If more than one player has to team up to defeat the monster, they split the treasure. Players can add cards to either side of a battle as they see fit, or even both sides if they are feeling exceptionally Munchkinly. Munchkin TMNT lacks some of the humour of the original game, but it is nevertheless a ton of fun. If the only Turtles you know happens to be from tv, you might be shocked at the artwork. This game, like others by IDW Games, is based on the IDW Comics versions of the story and characters. Turtle co-creator Kevin Eastman has been heavily involved in the IDW Comics’ version of his creation, so it makes sense that the art is more akin to the original, grittier, Mirage Studios era. At the same time, they’ve integrated popular characters from other iterations like Bebop and Rocksteady. The only real issues I have with this game are in the rulebook. For example, nowhere does it explicitly say which cards are the Door cards and which are the Treasure cards. They show examples of the front of both types, but the dark green and dark brown borders printed very similarly, and they never show the backs. For the record, Door cards have a brown back with a manhole cover, while the Treasure cards have a green back with a pizza box on them. The rules also interrupt themselves several times to mention the subtle accessory differences in the Deluxe Edition. I get that this made printing the rulebook much easier, but not having the Deluxe Edition it’s also really annoying. I love what they’ve done with this game, and I hope they come out with some expansions for it. They retail game comes with six hero cards, but there were another five characters exclusive to the Kickstarter, plus another four turtle promo cards. Just with the Usagi Yojimbo card alone, there could be another full-sized game, not just an expansion, based around that character and his crossover adventures with Leonardo and the others. The Turtles franchise is something unique, having gone through so many different companies and variations. But a game like Munchkin has no plot or continuity to maintain, making it the perfect vehicle to bring in some of the other variations as future expansions. It’s unlikely, but I’m keeping my fingers crossed. 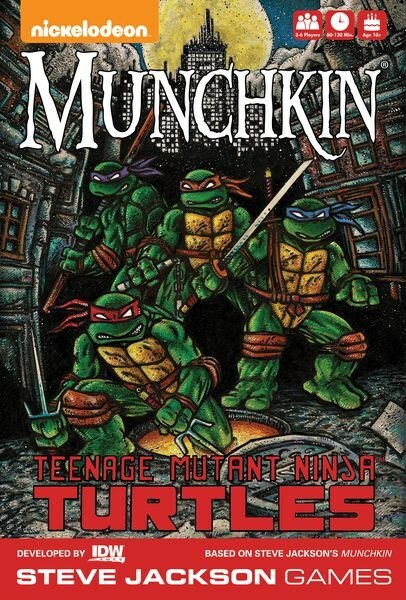 Munchkin Teenage Mutant Ninja Turtles was developed by IDW Games, based on the original Munchkin games by Steve Jackson Games. You can find everything Munchkin online at www.worldofmunchkin.com and everything else Steve Jackson Games online at www.sjgames.com or on Facebook at facebook.com/sjgames.